Does a step-up SIP work better than a normal SIP? Your income is moving up over time and therefore your static SIP does not provide for your additional saving capacity. The answer to this challenge can be a step-up SIP. Equity mutual funds have emerged as an intelligent way of creating wealth in the long run. If you use systematic investment plans (SIP), you also get the benefit of rupee cost averaging (RCA). What RCA does is to reduce your cost of holding the mutual fund units over a longer period of time. In fact, SIP works very well when there is volatility in the market since it is almost impossible to perfectly catch the highs and lows of any stock. A static SIP refers to a SIP where the monthly contribution remains constant through the life of the SIP. So whether you run the SIP for 10 years or 20 years, your monthly SIP contribution remains the same. Now, there is a problem here! Your income levels do not remain the same over time. Normally, your income is moving up over time and therefore your static SIP does not provide for your additional saving capacity. The answer to this challenge can be a step-up SIP. 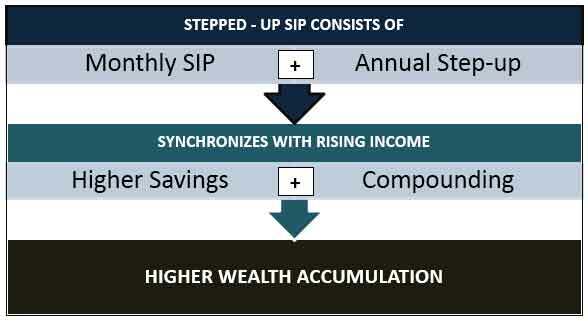 A step-up SIP is the same as a static SIP in all respects; the only difference being that the monthly SIP contribution is increased every year based on pre-set rule. For example, if you are contributing Rs10,000 in your SIP, you can step it up by 10% each year. So your monthly SIP contribution will be (Year 1 – Rs10,000/, Year 2 – Rs11,000, Year 3 – Rs12,100, Year 4 – Rs13,310 and so on). The SIP can be stepped up each year based on a fixed sum or a fixed percentage. How is a step-up SIP an improvement over the static SIP? Step-up SIPs are more realistic because your investment contribution is being linked to your income levels. When your income is increasing over time, it is not prudent to keep the SIP amount static. Step-up SIP overcomes that challenge by increasing the SIP amount each year. A step-up SIP is a compulsory additional investment each year. Normally, when income increases, the tendency is to spend the money. A step-up SIP enforces the discipline of higher investments each year so automatically you only get to spend the residual amount. That is a good discipline to enhance wealth. A step-up SIP enables the investor to focus their entire financial planning activity around just a couple of funds. Otherwise, each year investors tend to keep adding new funds and create a portfolio of too many different equity funds which actually becomes hard to track and manage. A step-up SIP actually takes care of that problem. Does a step-up SIP perform better than a static SIP? For a better understanding of this comparison, let us take two alternate scenarios. In the first scenario, the investor only does a static SIP of Rs20,000 per month for 20 years. In the second scenario, the investor steps up the SIP on an annual basis. Let us first look at wealth creation in the static SIP. Let us now assume that instead of a static SIP, the investor opts for a step-up SIP and explores different levels of step-up each year. The tenure of the SIP will continue to be 25 years. Let us now look at wealth creation in the Step-up SIP. The best way to compare is to look at the wealth ratio (ratio of final corpus/total amount invested). How does the static SIP have a higher wealth ratio than a step-up SIP? In a step-up SIP, each higher SIP is compounding for lesser time. Therefore, higher SIPs are not able to generate as much wealth as compared to the earlier SIPs. This distorts the performance against the step-up SIP. That is why, when you increase the step-up amount, the wealth ratio actually falls. The moral of the story is to start as early as possible and make the SIP actually work for you. Time matters more than timing and the amount invested!